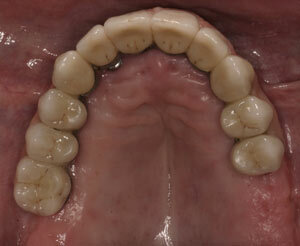 This example illustrates a complex full upper arch restoration for a patient with no remaining healthy teeth. Following intense planning, utilizing Cat Scan imaging, Dr. Simon placed 8 implants to support a fixed (non-removable) upper prosthesis. This is a sophisticated alternative to a complete denture.